Say hello to another instalment of The Vegan Kind. This is their TVK52, February 2018 lifestyle box. 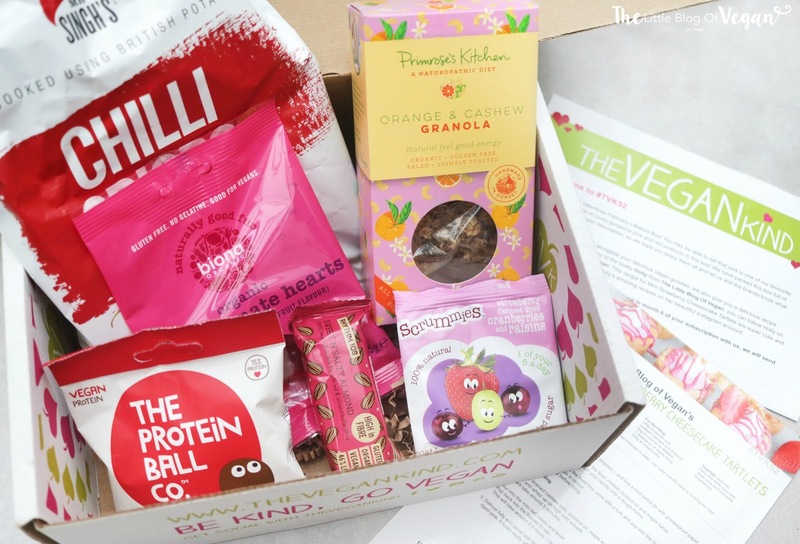 If you would like to know/find out more about The Vegan Kind and their monthly subscription boxes, click here to read more on my previous blog posts! As well as all of the delicious vegan treats you receive per month, you also get a recipe which I ALWAYS look forward to. I've tried quite a few of the recipes featured in the boxes and they've all turned out delicious! This months recipe is from....me, YAY!! It's my Mini strawberry cheesecake tartlets which are the perfect Valentines day & Mothers day treat! They're quick & easy to make and taste divine (plus look adorable). I hope you all love it?! It's a pleasure to be included into one of my favourite subscription boxes. I love how The Vegan Kind mix food with lifestyle and throw in a little extra goody! In this months box you get one of the Fruu lip balms in my favourite flavour, Watermelon. It's a clear lip balm which smells absolutely gorgeous. I've had a few lip balms from Fruu before and I really like them. They're vegan and cruelty-free too! As with all of the 'The Vegan Kind' boxes, when you buy a box a percentage of your purchase goes towards an amazing charity. This month's donation goes towards 'The Non-Human Rights'. The Non-Human Rights project are the only civil rights organization in the United States working through litigation, public policy advocacy, and education to secure legally recognized fundamental rights for non-human animals. Check out their groundbreaking work here. Get your own TVK lifestyle box here.